That's been the word + theme I've been chasing over the course of this past year. With that said, when I was planning our hot cocoa bar for this winter and Christmas season I knew I would totally use the things + ideas I had started dreaming about last year and never had time to execute. I had actually made a couple of weak attempts at the snickerdoodle hot cocoa last year using the Homemade Hot Cocoa Mix I've shared with you all previously. BUT...something just wasn't right. It didn't WOW me. And so...with an anticipated move for our family and so much up in the air it left the holidays spinning out of control last year. I just let the Snickerdoodle dream go. This year however...we are settled into our new home and I was not about to let the dream go. Honestly, it had never let go of me. First things first, I had to perfect a "White Chocolate" hot cocoa mix in order to create the Snickerdoodle Hot Cocoa. You see, I figured out trying to use traditional hot cocoa just wasn't creating the creamy, snickerdoodly flavor I was looking for. After several fails I finally nailed it. And I mean NAILED it you guys. It's soooo good. 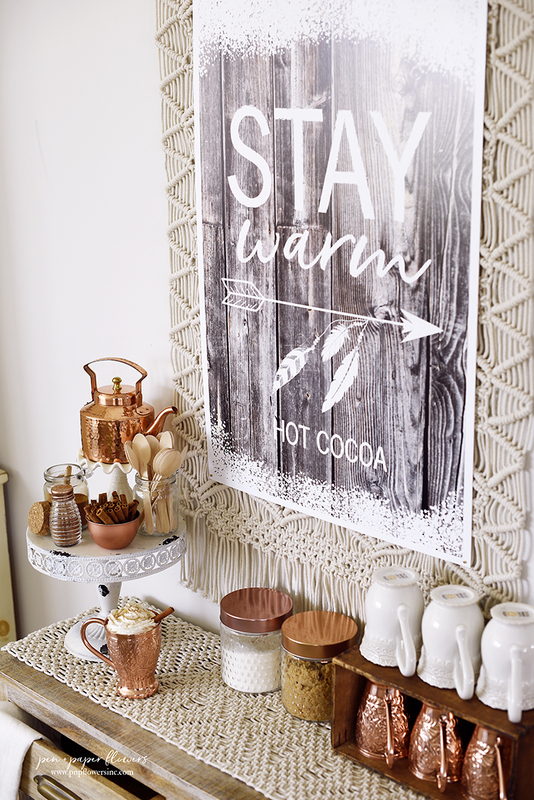 Anyway, that's how this "Boho-ish" Hot Cocoa Bar took on a life of it's own. 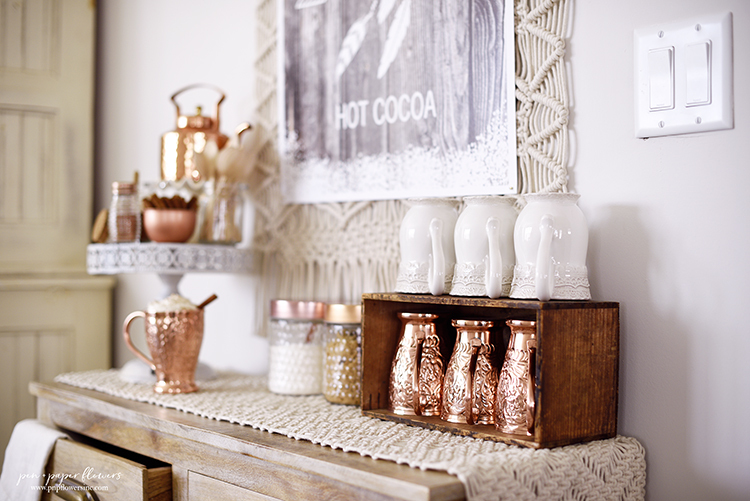 Once I figured out the hot cocoa mix and was able to perfect the ingredients needed to add to the mix to create the snickerdoodle flavor - well...that made the whole hot cocoa bar set up even more simple and I was able to finally envision how to pull everything together. 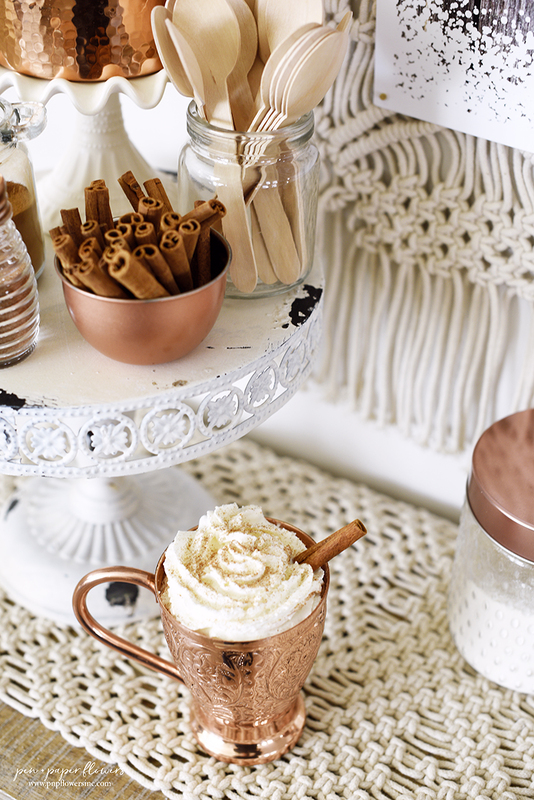 Pssst....the snickerdoodle hot cocoa doesn't even need marshmallows! Nope. 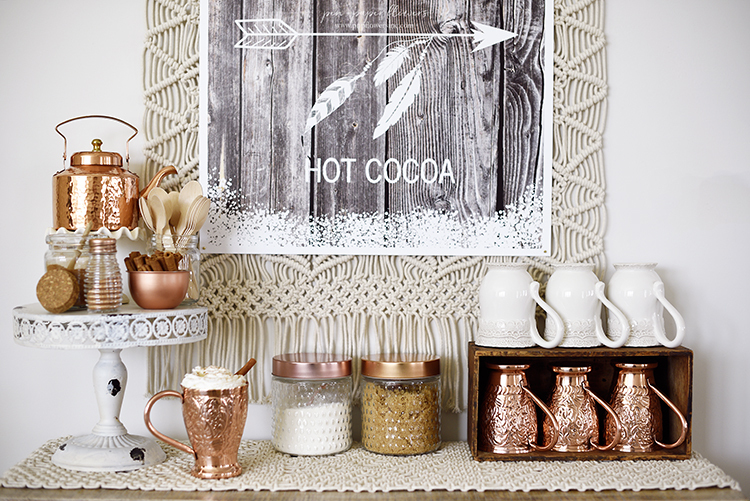 No marshmallows on this hot cocoa bar. *gasp* But I am telling you - you won't miss them with this hot cocoa. Trust me. I'm all about tradition and I love marshmallows in my hot cocoa just as much as the next person but I promise you don't need them. 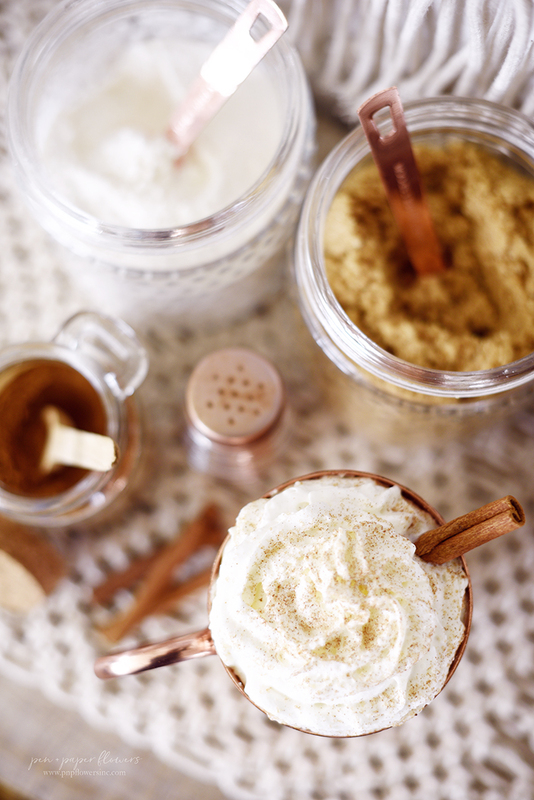 The only topping you'll want or need is cinnamon + sugar on top of your whipped cream. That's it. (perfect cinnamon sugar recipe HERE). Without all of the usual suspects i.e., the peppermints, chocolate chips, white chocolate chips and other fun toppings...all of a sudden my hot cocoa bar felt perfectly aligned with my "simple" mindset. Even the sign I decided on was simple. I used the same background and arrow graphic from the "Cabin in the Woods" hot cocoa bar set up and just simplified the wording. 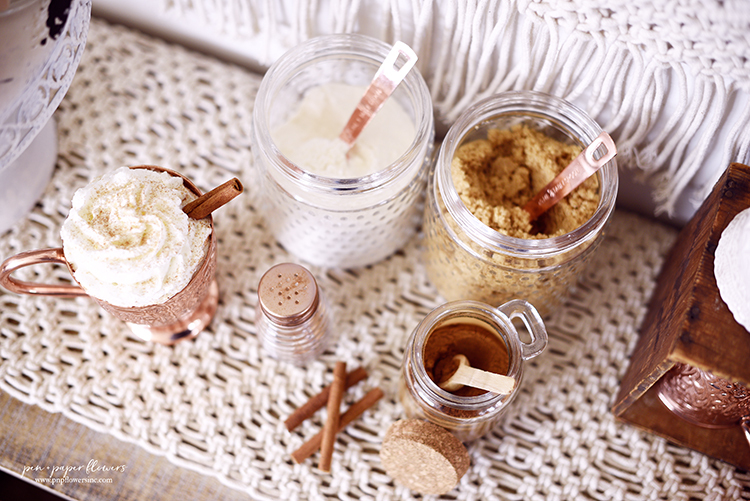 White Chocolate Hot Cocoa Mix, Brown Sugar, ground cinnamon, a shaker filled with cinnamon sugar and some cinnamon sticks for cuteness are all you need for this "Sweet + Simple Snickerdoodle" Hot Cocoa Bar. 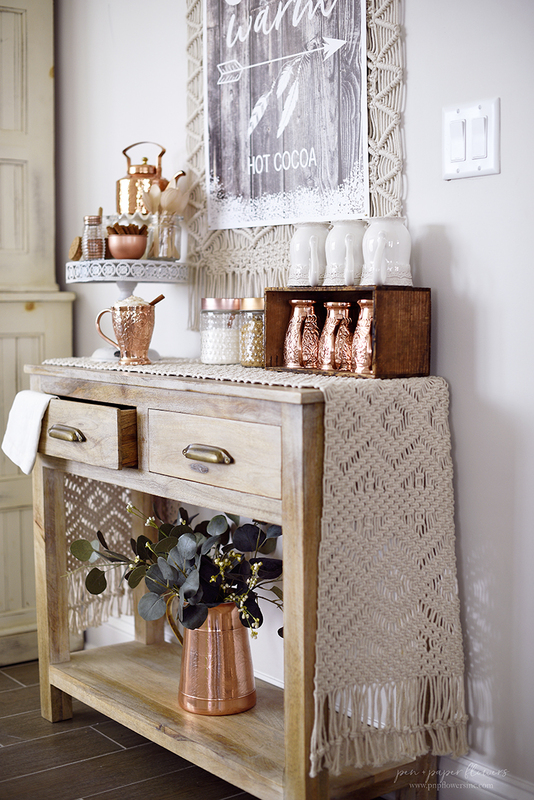 I love the copper accents mixed with the wood + macrame details. I love all of the Hot Cocoa Bars I've done through the years....for different reasons. The White Hot Chocolate recipe will hit the blog tomorrow, followed by the Snickerdoodle Hot Cocoa recipe. And they both have cute printable recipe cards waiting for you all to print. 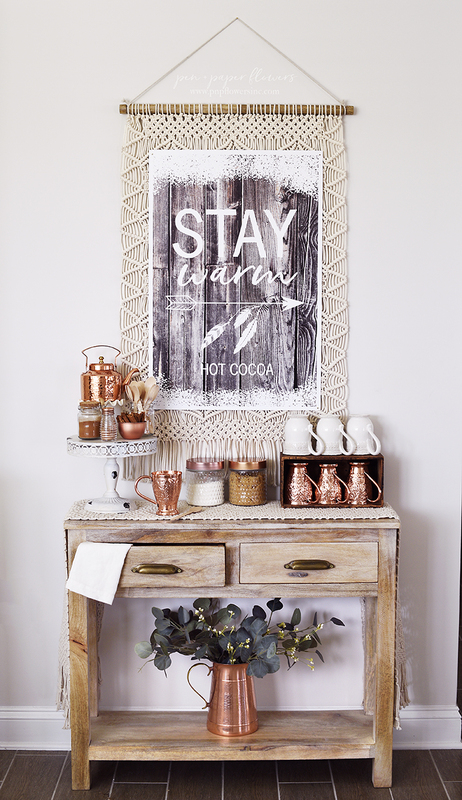 I hope you love how it turned out and more than that, I REALLY hope you are inspired to set up your own hot cocoa bar this year. 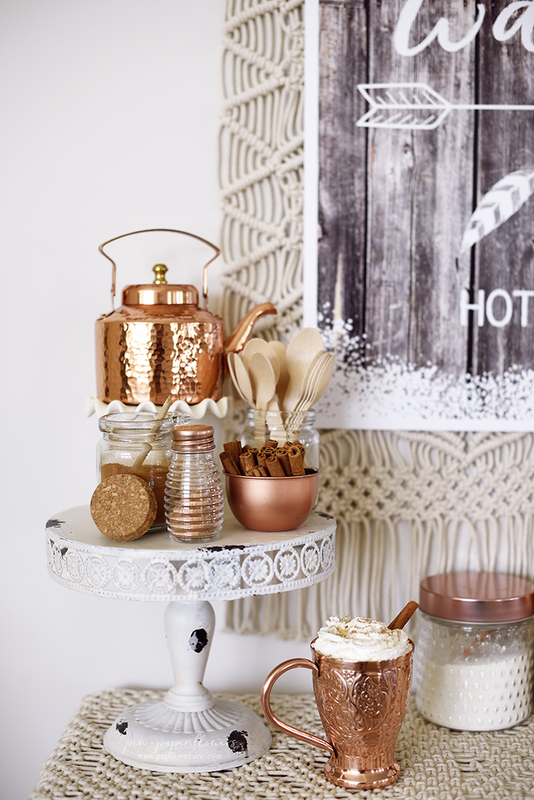 Copper Mugs - handles get hot so they are perfect for warming cold hands BUT don't get burned. 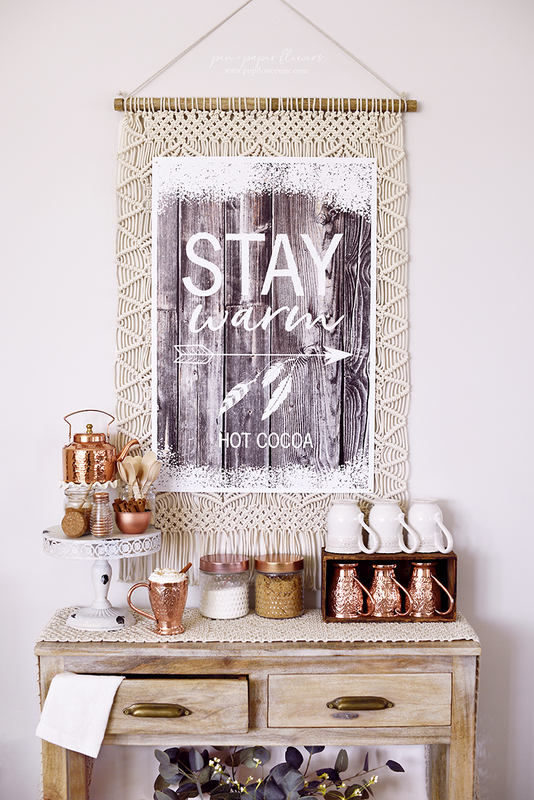 STAY WARM HOT COCOA SIGN - this one is 20x24 and I had it printed at Walgreens onto posterboard for about $15 - with a coupon. So AWESOME!! I will be making this available in my Etsy shoppe this week. TABLE - from TJ Maxx - I love the drawers on the front for holding extra napkins, spoons, etc. 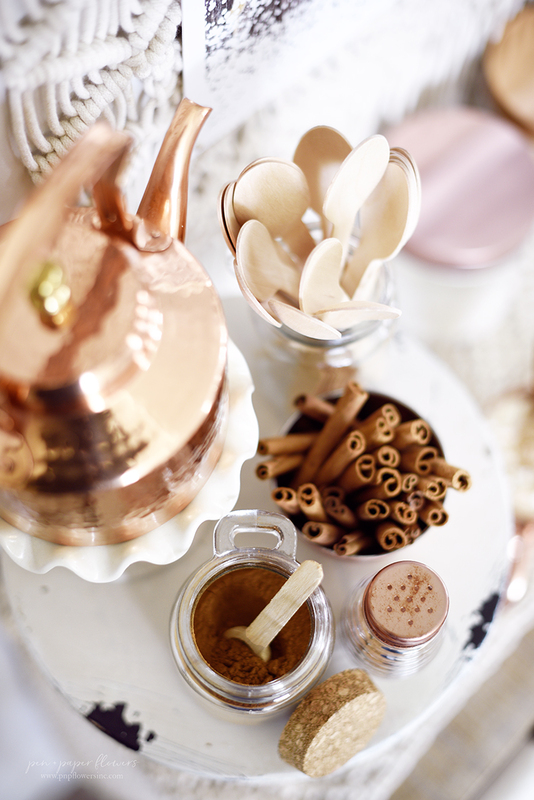 CINNAMON SUGAR SHAKER - I bought a set of THESE copper topped shakers and filled one with THIS CINNAMON SUGAR RECIPE. I really struggled with the set up at first. I kept trying to complicate things by adding christmas trees and wreaths and stuff to "holiday-ize" it. But no. Sticking with a simple pitcher of the Eucalyptus on the bottom totally finished it off perfectly. "Simple!" people. I just. need. simple. cocoa. I want one every night. Ha! !